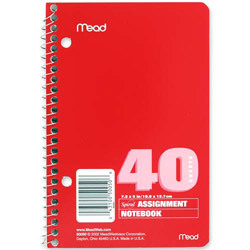 Spiralbound assignment book contains 40 sheets of ruled white paper. Laminated cover and each sheet are two-hole punched to fit into two rings of a standard three-ring binder. A template for a class schedule is preprinted inside the front cover. Assorted Ruled and Subject Notebooks from Mead! 642 In Stock today.